Breakups and separations are one of the most common reasons for which people initially seek therapy with a psychologist or counselor. These life experiences often stir up our deepest insecurities and fears about both the past and future. This seems to be true whether you are the one pursuing or the one on the receiving end of the breakup. While they can bring up intense, often overwhelming feelings, breakups can also bring an infusion of new energy and excitement into an otherwise stale routine. 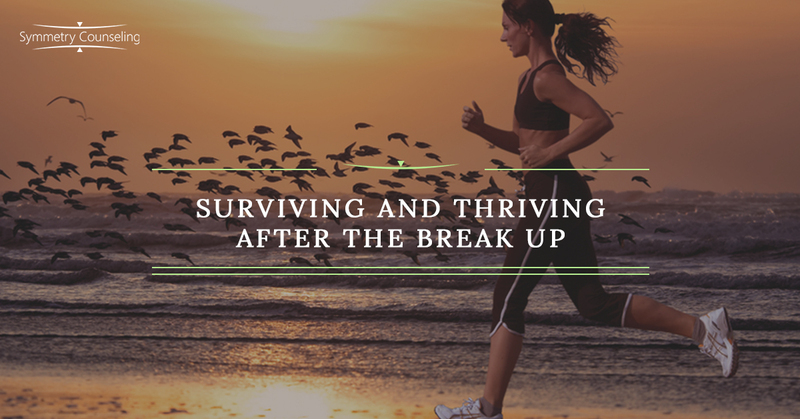 Although there is no one way to survive a breakup, there are some themes that can help the experience become more helpful than harmful in the long-run. Give yourself the gift of distance. Breakups are a disruption of connection. Initially, this is often jarring, especially if we are in the habit of seeing and speaking with a partner every day. Whether the distance is physical, emotional, or both, giving yourself space gives you evidence that you can, in fact, survive days and nights without your partner. Yes, it will be uncomfortable – perhaps, incredibly so. It’s important to remember at this stage that emotions are temporary and will change if given the opportunity. During the separation process, your partner often becomes a trigger for renewed resentment, disappointment, and anger. It is normal, healthy, and appropriate to step away from triggers at this point. If you’re unsure how to do this, your psychologist or counselor can offer suggestions. We have an understandable desire to ignore or fight unpleasant feelings, whether or not we are conscious of it. Despite our efforts, suppressing the unpleasant feelings often causes them to grow and last longer than they would have if expressed appropriately. Write, discuss, and vent your feelings to appropriate, safe, and supportive people without your own self-judgment. There is usually room to evaluate our part in why the relationship ended, yet attempting to analyze ourselves too soon can cut short the necessary phase of emotional release. This process can be done solo, or with the help of friends or a therapist. It is common in relationships for a couple to become somewhat insulated and isolated. If you have lost the connection you once had with friends, start by texting a few for coffee or dinner. Try to be honest about where you are in your life but remember not to turn the entire get-together into a processing session about your breakup. Get invested in what is going on with them and their lives. This may also be the time to invest in a quality therapist for individual therapy sessions, if you do not already have one. Remember that we do not heal in isolation. Although it may seem tempting to isolate, our task is to stay engaged, seen, and heard. This is the time to take the trip, enroll in the class, or explore a new hobby! There is often a stereotype that post-breakup behavior is reckless, impulsive, and destructive. While there are definitely patterns of behavior that can veer into destruction, there is also room for healthy exploration of previously unconsidered possibilities. Start by taking yourself on one solo date per week – try the Garfield Park Conservatory, a Chicago museum, a picnic by Lake Michigan, or a new restaurant. Get interested in who you are, what you like and dislike, and what you value in life. You can get through this. Remember that everything you are feeling is temporary and, with enough support, patience, and action can turn the page into an exciting new chapter in your life. Let’s get started! If Symmetry Counseling can help, please contact us online or give us a call to schedule an appointment at one of our Chicago locations. Or, if travel and time are concerns, ask about a tele-therapy session.